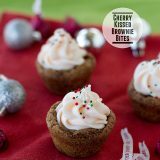 Mini chocolate brownies are filled with a Cherry Cordial Creme Hershey’s Milk Chocolates, then covered with a cherry cream cheese frosting for a bite-sized holiday treat. Preheat the oven to 350F. Spray mini muffin pans with nonstick cooking spray. Whisk the flour, baking powder, salt and cocoa together. Mix the melted butter and brown sugar in a large bowl. Stir in the egg and vanilla. Stir in the dry ingredients. Place about 1 tablespoon of batter into each muffin cavity. Bake until the brownies are set, 10 to 12 minutes. The brownies should naturally fall in the centers, but if they don’t, press down the centers with the handle of a spoon. Cool completely. Beat the cream cheese and butter until smooth. Gradually add the powdered sugar and beat until smooth. Place the frosting in a piping bag fitted with a star tip. Turn the brownies out of the pans. Place 1 unwrapped kiss in each brownie. Pipe the filling on top of the cups, covering the kiss.